Located in Kane County, Elburn is one of the fastest growing towns in Northern Illinois. Elburn is one of the state’s oldest communities. The first settlers arrived in the area in 1834 and quickly established it as a regular stopping point for those traveling west from Chicago. Elburn was later incorporated in 1886, with its original name of Blackberry Station. The town’s name was changed to Elburn shortly thereafter. Elburn remained a largely rural town until the 1990s when suburban-style tract housing became the norm and several new subdivisions began dotting the rural landscape. With the opening of a Metra commuter rail station in 2006, Elburn has become a popular place for commuter families looking for more affordable housing stock. The Elburn station is currently the last stop on the Union Pacific/West Line. The population of Elburn grew by over 100 percent from 2000 to 2010. Today, Elburn has a thriving downtown business district with many locally owned shops and restaurants that draw people from all across the area. Elburn construction company Carmody Construction has been serving the residents and businesses of the community since our founding in 1948. We provide windows, doors, siding, roofing and remodeling services with only the highest quality craftmanship and materials. 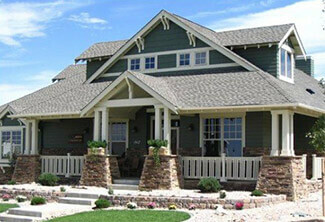 Carmody Construction also completes home additions and can custom build your new Elburn home from the ground up. For Elburn residents who have experienced wind or hail damage in recent storms, Carmody Construction is expert in dealing with insurance companies to get your home repaired with no hassle while maximizing your insurance benefits. We are a preferred provider with many of the country’s largest insurance companies. To speak with a Carmody Construction representative today, request a consultation, or call (630) 355-0002. To view our work, be sure to visit our galleries and read our company reviews. Live in Elburn? Need Windows, Siding, or Roofing Services? Schedule an appointment today!